Centrum Wiskunde & Informatica: Visible and Infrared image registration in man-made environments employing hybrid visual features. 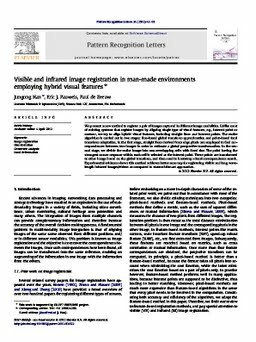 Visible and Infrared image registration in man-made environments employing hybrid visual features. Han, J, Pauwels, E.J.E.M, & de Zeeuw, P.M. (2013). Visible and Infrared image registration in man-made environments employing hybrid visual features. . Pattern Recognition Letters, 34(1), 42–51.